1 x Flexible Tripod?If your phone is too heavy, please use Flexible Tripod to support the Phone Clip? 12X50 High Power Magnification: Have the best view in your outdoor adventures. To see 12X closer with a clear and bright image with 50mm objective diameter wide lens. Large Field of view (125 ft1,000Yds ) . The most powerful hand held monocular available in the market today, that also provides the most pleasant and clear view. 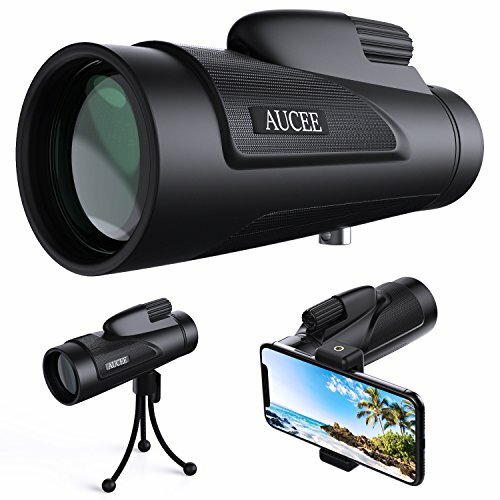 Easy focusing perfect for Hiking,Hunting,Climbing,Bird watching, Watching Wildlife and Scenery. Large BAK-4 Prism and FMC Fully Multi-coated Lens Elements: Strengthen the key function of a monocular, guarantee superior light transmission and brightness, which makes your view clearer and delivers crisp images. And more, it built in lens dust cover can prevent lens from dust/moisture/debris, make sure you see everything in a clear detail . Waterproof , Fogproof , Shockproof , Dust-proof and Durable: Its sealing property ensures the living waterproof , fogproof ,dust-proof functions. Rubber armor with stripes makes it comfortable for use, increase the friction, keeps it from slipping out from your hand and its rubber finish has shock resistance. Compact shape and appearance, durable metal inner hull structure, classic and durable. Its tight fitting protection makes it usable to withstand the tough weather conditions. Perfect Accessories: Extendable stable tripod and comes with a newest quick alignment smartphone adapter--compatible with iphone and almost all other smartphones on the market. Provides a secure, non-slip grip, and durable external protection, tripod stand for hands-free get a HD image or video easily, enjoy your monocular more perfectly. The Best Deal With 100% Risk-Free Satisfaction : We offer ONE YEAR WARRANTY, if our camera has any problems, please contact us (could send us mails). If the camera is not damaged by man-made, we will replace for you totally free and lifetime free tech support. Thanks for your purchase. If you have any questions about this product by AUCEE, contact us by completing and submitting the form below. If you are looking for a specif part number, please include it with your message.